NV5 provided civil, utility, and surveying services on this high-rise project in downtown Raleigh, North Carolina. 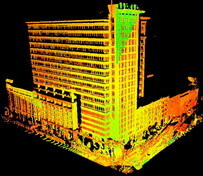 One of the first firms in the nation to have a 3-D Cyrax laser scanner for high definition surveys, NV5 scanned Two Progress Plaza, making it the area’s first high-rise building with a high-definition scan on file. The scan validated the structure’s coordinates for the real estate closing and provided an as-built survey to detail any encroachments for the public record. Our scan also provided a complete external picture of the Duke Energy Building — an image and measurements that can be used as a reference for any construction questions regarding the structure’s initial state.